Iraq_Election_Martyr_Najaf_1: Election Day Martyr: Casualties of War: Global News Portfolio: New Orleans based Photojournalist covering the Deep South and beyond. 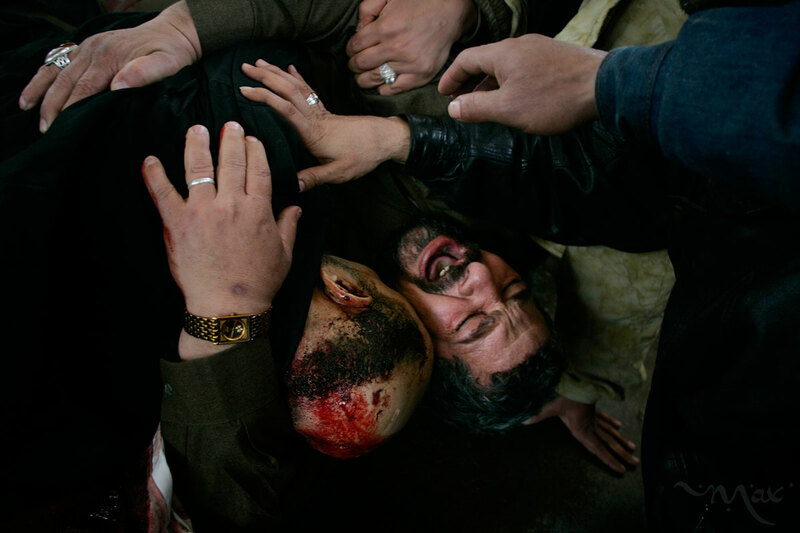 With hands of family members reaching out to him, Karim Rahim Judi Yacoubi, bottom right, shouts out in grief as he holds the corpse of his brother, Naim, 37, who was killed during a suicide bombing during Election Day in Baghdad. Naim was killed while he was taking tea to election officials at an Iskin neighborhood polling station where he had voted earlier that day. Naim’s body was being prepared for burial in the Najaf cemetery washroom when the family mobbed the body in an outpouring of grief.